Gmail's new compose interface has many useful features, but there are also some annoyances. 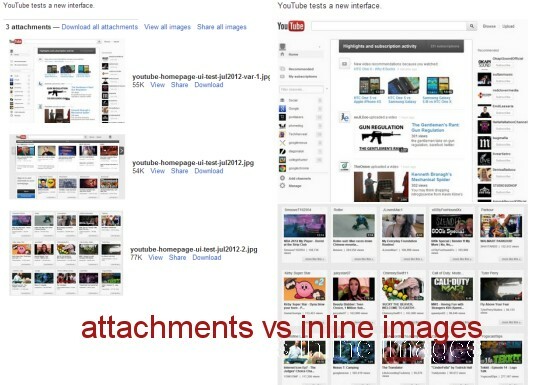 The old interface had two ways to upload images using drag and drop: as attachments or as inline images. 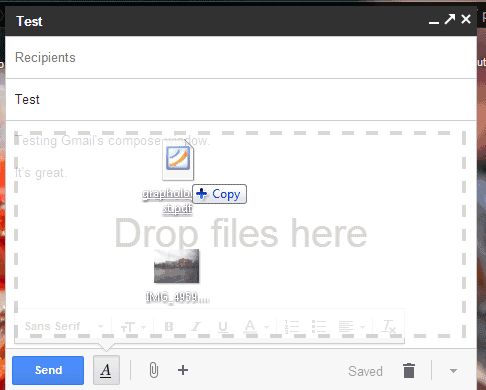 The new interface only lets you embed an image inside the message when you drag and drop it. There are many reasons why you might find this feature annoying: it's more difficult to compose a message after adding a bunch of images, the images could be distracting, Gmail no longer adds cool options like "download all attachments", "view" or "download" when you open the message, some mail clients block inline images. Fortunately, you can use the "attach files" paperclip button to add image attachments. The "insert photos" button will embed the images. If you still want to drag and drop a photo, you can drag the photo you want to attach and some other random file (for example, a PDF file or another image) and remove the random file. It's a workaround that forces Gmail to treat images like regular files. When you drag and drop multiple images, they're added as attachments they're now embedded, but you can use the same trick (updated: June 2013). For now, you can "temporarily switch to the old compose" interface by clicking the arrow button at the bottom of the compose box and selecting the corresponding option, but the new interface is here to stay, while the old one will be retired in the near future. 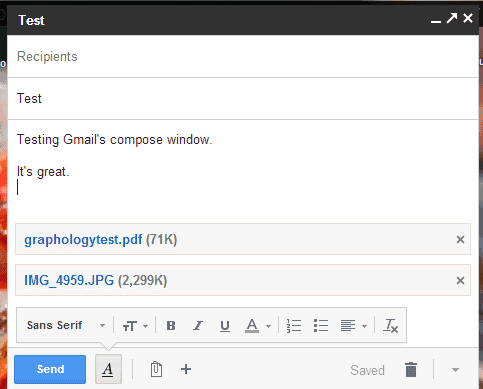 The new UI for composing messages is now the default for all Gmail users. Update (June 2013): There's now a way to attach images using drag and drop without using these workarounds. You can also CTRL + C -> CTRL + V a copied image (not copied file). I thought Google does LOTS and LOTS of usability testing before releasing features to the public, even if it was a change to the color of a line. I can't imagine annoying changes like this passing such rigorous usability tests. Has Google's testing practices changed? Thanks for sharing this nice post. Google seems to be doing everything these days, it is not surprising that the Internet giant has developed online storage and synchronization.Now it becomes easy to save and share files through Google Gmail Drive. What the HELL happened to "reply all"? And why the pop-up window? It's dreadful. What the hell have you DONE, google?!? As a recipient of the email, this has made GMail unusable for me when someone sends me large images inline. It's not just annoying, it's simply unusable. I just got an email with two large image attachments and I can only see about 10% of one image without scrolling. There is no way for me to easily open the imagine in a new window, reduce the zoom to view the full image, etc. WTF Google! How did this pass usability tests? It's a pretty new compose window googs, but it just ain't functional enough. Please take out inline attachments for jpg or maybe just an option I can choose if a lot of people like it or something. Not sure why the embed images is the default, I've never once wanted to send an email with embedded images. Does anyone actually do that? 1) No Reply All, 2) I know HOW to add attachments, but I want to SEE them there. I want a visual that they're on there before I hit Send..
A simple "Drag images to paperclip to attach" would be so simple. Most cameras (including smartphones) take pictures way too large to comfortably view inline. There's no excuse to remove the basic functionality to drag and drop images as attachments. A poor choice, and and a glaring regression.